"I just received my pocket size photo notebooks from you and am thrilled with how they came out. These little spiral notebooks are going to make great birthday party favors! Thanks for the wonderful job and great customer service." "I ordered a dozen of these photo notebooks as a gift for my friend's birthday using a photo of her dog. She said it was one of the most thoughtful gifts she ever received. So, I'm back with photos of my kids as a gift for the grandparents." - Paula G.
"Your photo spiral notebook favors were the hit of my daughter's bat mitzvah. All her friends loved them. It's such a unique idea and you did an excellent job." 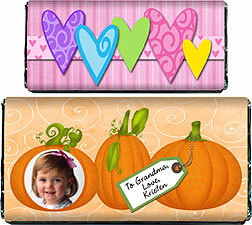 - Meredith L.
We, at Photo Party Favors, are happy to offer absolutely free, printable photo candy bar wrappers! The same artists that have designed the beautiful photo bookmarks, mint tins, notebooks, magnets and other photo favors that we sell on our website for your birthday, anniversary, christening and every occasion, have created these chocolate bar wrappers as a freebie for you. Please feel free to print any of these candy bar wrappers as favors for your party or as a gift for one person. Each one of these designs comes with complete, easy instructions. These chocolate bar wrappers are available in either a standard 1.55 oz. Hershey bar size or in the large 5 oz. Hershey bar size. After you have printed the chocolate bar wrapper of your choice, you can personalize it with your message, and in some cases, even add a photo. We encourage you to print as many as you want and have fun with these - as long as it's for personal use only. That simply means that they are copyrighted designs, so you can't sell them or make a profit from them. Don't forget to LIKE us on Facebook for even more free printables, party recipes and tips! DON'T MISS OUT ON MORE FREE STUFF! Check out our other FREE PAGES on this website! We've got all kinds of goodies just waiting for you! Plus Special Occasion Quotes, Trivia, Party Recipes, More! Looking for freebies, party ideas, recipes, inspiration? "Follow" Photo Party Favors on Pinterest and you'll be rewarded with an ever-growing variety of really cool stuff!!! If you like free stuff, you're going to love our Facebook page. "Like" Photo Party Favors on Facebook and get our latest and greatest FREE candy bar wrappers (some available exclusively for our Facebook friends). And, you'll find lots of other free stuff, like our high quality, printable folding thank you cards, fill-in party invitations, gift tags, recipe cards, place cards, as well as party recipes, contests, quotes, trivia, articles and other printables. 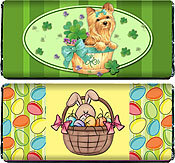 Facebook Preview: Right now - Grab some brand new printables - St.Patrick's Day and Easter candy bar wrappers, fill-in invitation and more are coming up. We're always adding great stuff on Facebook - Don't miss any of it!!! Check back with us often - we will try to add new free candy bar wrappers and more on this page, whenever we can. Plus don't forget to look at the other things our business offers at low prices - quality, custom, personalized photo favors and photo invitations. If you don't want to make your own favors, let us do the work for you! * Wrappers with an asterisk are for LARGE 5.5 oz. candy bars.